She submitted the pic above. I said, “do ya want to write a guest blog?” She said yes and here ya have it! I get the day off! Which is great because it’s 1:34AM and I just played an OT beer-league hockey game to a 0-0 tie! Wh in the hell plays a to a scoreless tie in beer-league hockey? The Pittsburgh International Airport has gone through some updates. It has shiny new floors, new upscale shopping (forgot your Armani jeans? We’ve got ‘em), and even a martini bar. But that isn’t what excites visitors to our airport. Visitors to our airport have a unique selfie opportunity awaiting them as they head to baggage claim. At what other airport are you greeted by Franco Harris AND George Washington? But that isn’t all! Right there in between Franco and George, rearing his mighty head as you travel down the escalator, is the mighty Tyrannosaurus Rex. Placed there by the Carnegie Museum of Natural History to draw attention to its world-renowned collection of dinosaurs, the 15’ tall, 30’ long T-Rex greets new visitors to Pittsburgh, and says “welcome home” to wayward yinzers. The enclosure in which T-rex sits collects quarters, dimes, dollar bills, and even money from other countries. 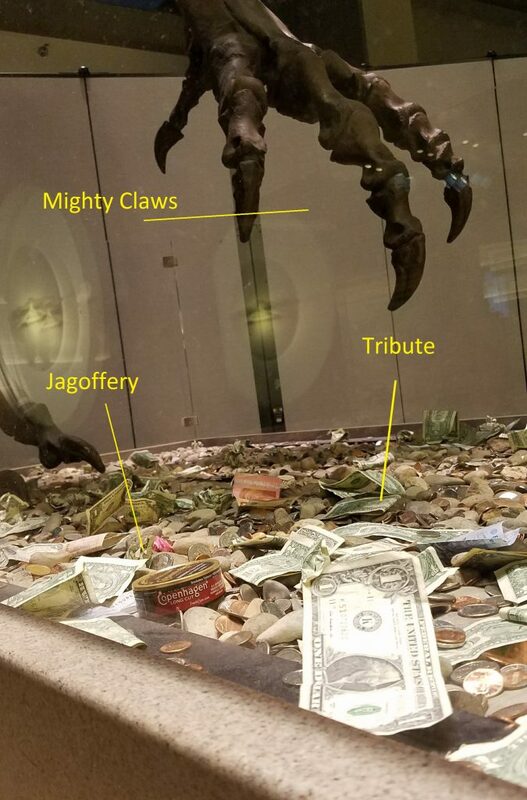 Legend has it that this happened by chance – someone threw the first dollar at T-Rex’s feet and other travelers repeated it. The money is collected to support the museum. But last week on returning home from a business trip, a shiny object at T-Rex’s feet caught my eye as I rode down the escalator. Upon investigation, did I find treasure? Jewelry? Another fitting tribute to the Dino-King? Nope. It was a Copenhagen can. Now, the dinosaur enclosure doesn’t LOOK like a trash can. It doesn’t sit such that a chew-spewing visitor could accidentally drop the can into the enclosure (do chew spewers spew while riding on escalators?) Nope – someone made the effort to take Copenhagen can out of jeans pocket (I’m sure sporting the requisite white ring caused by years of Copenhagen cans) to toss the can into the enclosure, at the feet of the King of the Pittsburgh International Airport. One can only speculate as to why he’d (sexist perhaps, but I’m assuming it was a he) feel the need to toss that can. Was it a tribute to mighty Rex? Were his hands full and something had to go? Was he a triumphant Trump fan spitting into the eye of uppity urban Pittsburgh Hillary supporters? Probably not. We can be pretty sure some jagoff thought it would be funny. We can imagine him, camo hat on head, hunting license flapping in the escalator breeze, jagoff friends howling at his display of wit, taking aim and letting fly. We can only hope that the can toss wasn’t accompanied by a chew-and-spew. Let me dig down to my proud yinzer roots to respond. This is the King of Dinosaurs! Have some respect ya jagoff! Thanks to Lynn for being our guest blogger and Honorary Jagoff Catcher today! jagoffs are everywhere, clowns to the left of me, jokers to the right!